Timothy Jung is a shareholder with Lind, Jensen, Sullivan & Peterson, P.A. Timothydefends workers’ compensation, personal injury and commercial claims. Since 1987,he has established an impressive track record of effectively resolving the myriad claims that follow from accidents, injuries and other disputes that arise at the workplace, the business premises, or on the roadways. 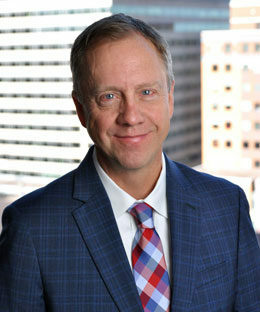 Timothy’s legal background is unique in that he is equally effective litigating workers’ compensation and civil disputes, including the claims that involve both. He regularly defends businesses of all sizes, governmental entities such as counties and school districts, and individuals regarding any type of claim that could possibly arise from an accident or injury. This experience has enabled Timothy to advise clients from a broad perspective taking into account both workers’ compensation exposure and civil liability. Many insurers and self-insured employers choose to retain specialty counsel for matters of alleged employer liability (such as Lambertson contribution claims or retaliation claims) and subrogation recovery actions, and Timothy frequently serves in that capacity. Assisting clients with the fall-out of ordinary accidents to catastrophic events such asa bridge collapse or shooting, Timothy takes a global approach to resolving all issues in an efficient manner tailored to the specific needs of the client. In addition, close relationships built over decades with clients allows Timothy to participate in loss prevention and risk management on a regular basis.